To set up HomePod, you’ll need an iPhone, iPad, or iPod touch capable of running iOS 11.2.5 or later, and an Apple Music subscription to play songs. Got these? Good. Connect to Wi-Fi and enable Bluetooth, then simply hold your iOS device next to HomePod. You’ll be asked to share your Apple account settings and do a few quick tests. In a matter of a few clicks, you’re good to go. Play songs from your Apple Music subscription. Get news and weather reports. Ask Siri to dictate and send text messages via your iPhone. Use HomePod as a speakerphone for iPhone calls. Ask any trivia question you can think of. Siri knows all. You can also use your HomePod to control any Apple HomeKit devices in your home, like smart lights, smart door locks, and smart thermostats. You'll mostly be using your voice to interact with your HomePod. But you can also take a more hands-on approach, and use the old-school power of touch to control your music. 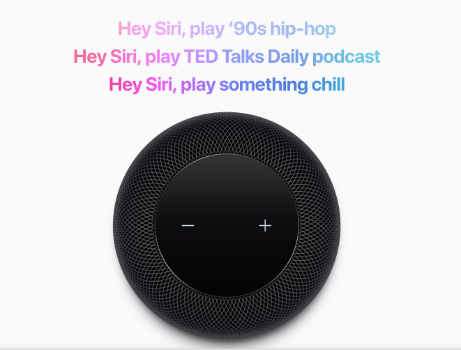 Basically, the top of your HomePod is a giant touch panel - tap it once to play or pause a song, tap twice to skip to the next song, tap three times to skip back, or tap and hold to call upon Siri. The HomePod is a stunning sounding speaker, with a clean and balanced sound. The bass, in particular, is big, deep and powerful. The HomePod can recognise the shape of your room, and can beamform (or steer sound, in other words) to give you the best possible sound quality. For example, if you put your HomePod in a corner, it’ll pump sound into the room and not against the walls. Even if you move the speaker around, it adjusts in real time. If you’re an iPhone or iPad owner with an Apple Music subscription - and maybe even have an Apple Homekit device or two dotted around your home – then the Apple HomePod more or less has your name on it. If you’ve already invested in one, let us know how you’re getting on with it. Or, ask us a question and we’ll look into it for you. Go ahead and drop us a line below.